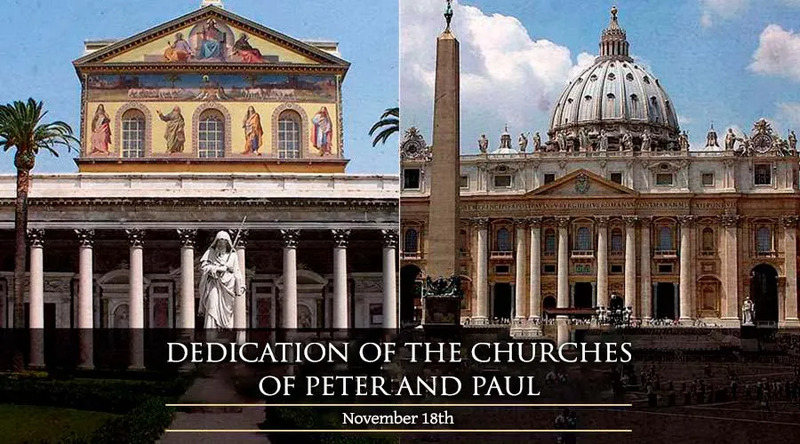 This feast celebrates the dedications of two of the four major basilicas of Rome. Saint Peter’s Basilica was originally built in 323 by the emperor Constantine. The basilica was constructed over the tomb of Peter the Apostle, the Church’s first Pope. After standing for more than a thousand years, Pope Julius II ordered the building to be torn down due to structural concerns. The construction of the new church spanned over 200 years before its completion. It was dedicated on Nov. 18, 1626. It is considered the most famous church in Christendom. Saint Paul´s Basilica is located outside the original walls of Rome. It was also originally built by the emperor Constantine though it was destroyed by fire in 1823. Donations from around the world made the reconstruction possible. Before the completion of Saint Peter´s Basilica, St Paul's was the largest church in Rome. The Basilica was built over St. Paul´s grave. Pope Pius IX consecrated the Basilica in 1854. These two churches continue to draw millions of faithful pilgrims each year as well as many visitors from other faiths .